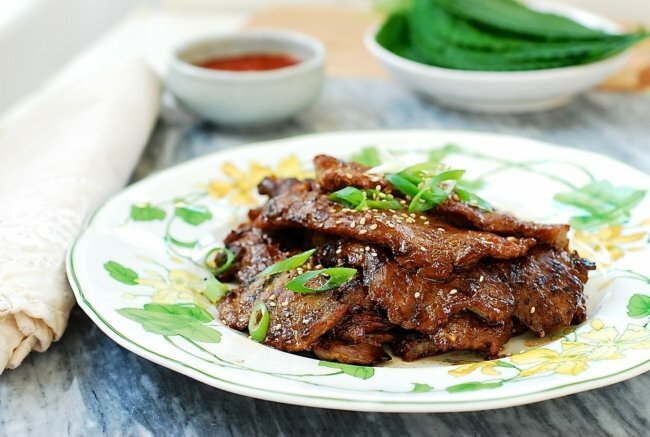 Korean beef bulgogi can be made with any good quality cut of meat. Flank steak is full of beefy flavor, but somewhat tough, but this marinade with some juice from a can of pineapple quickly tenderizes the flank steak. I’m in NYC for a few days visiting my children! 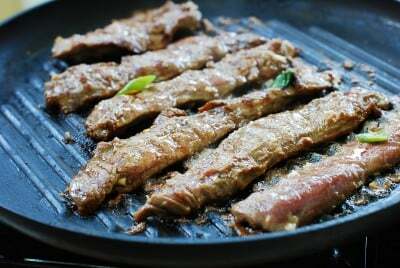 Before I left home on Saturday, I prepared some foods to bring to them, including this bulgogi made with flank steak. 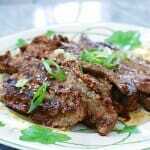 I quickly cut up 2 flank steaks, in a pack from Costco, and prepared this marinade that works really well with flank steak. While I was doing all that, it occurred to me that I should also share this recipe I’ve been enjoying for quite some time. 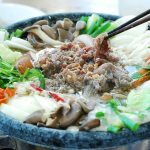 The classic bulgogi is typically made with thinly cut ribeye, but it can certainly be made with any good quality cut of meat. I find flank steak works really well! 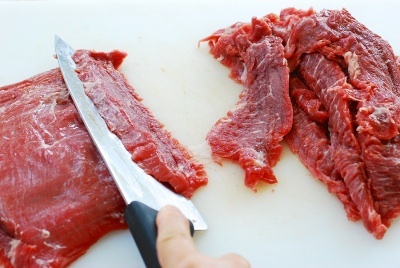 Typically, flank steak is grilled whole and then sliced to be served. 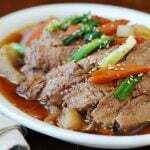 I also have a recipe here where I cooked the whole flank steak and then sliced to serve for my slow cooker bulgogi. 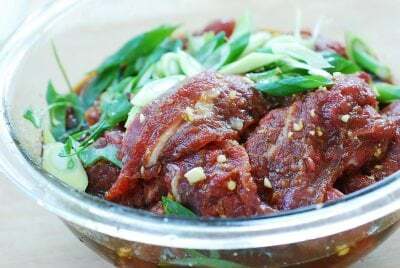 For regular bulgogi, the meat is sliced before being marinated. Flank steak is full of beefy flavor, but somewhat tough, so it’s important to cut against the grain. This marinade with some juice from a can of pineapple does the nice trick tenderizing the flank steak. 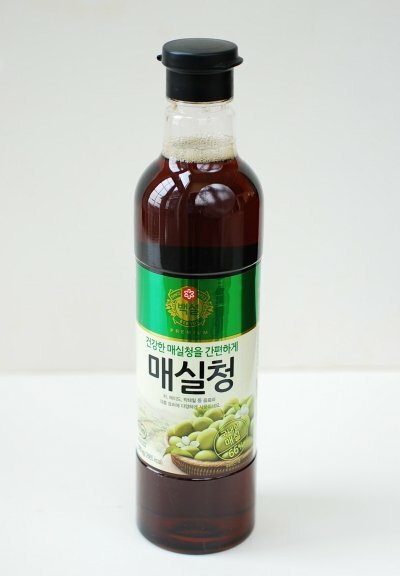 You can substitute it with Korean green plum extract (maesilcheong, 매실청) or grated Korean pear. I cooked some for our lunch within an hour of marinating, and the meat was tender but pleasantly chewy. 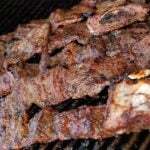 It will be best to marinate up to a half day, but you can marinate longer if you like your meat very tender. 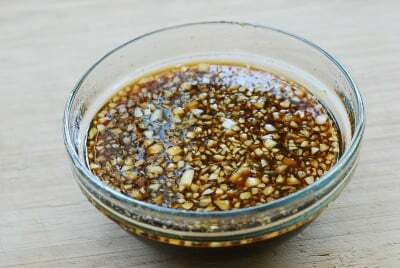 If you have made my all purpose marinade, you will simply need to add the pineapple juice, ginger, and sesame oil to 1 cup of the all purpose marinade to make a similar marinade as this one. Slice the meat (about 1/3 to 1/4-inch thick) against the grain at a steep angle. Combine all the marinade ingredients in a bowl, and mix well. Add the meat and scallions and mix well until evenly coated. Marinate at least for 1 hour. Heat a grill pan or a skillet over high heat and add the meat slices. Lower the heat as necessary. The marinade may burn if the heat is too high. Cook until the meat is cooked through and slightly caramelized, one to two minutes each side. I’ve actually used your usual bulgogi recipe with flank steak before, but didn’t add the grated pear and the meat was still tender and the flavour fantastic. That’s great to hear! 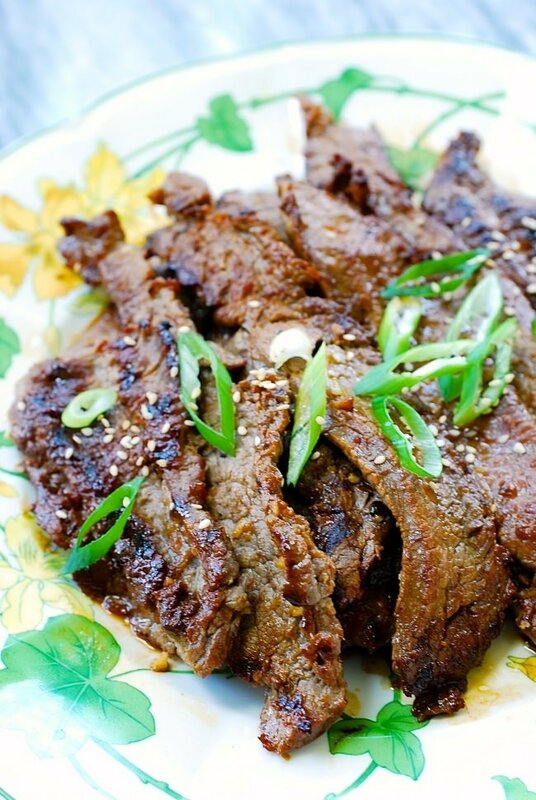 Try this recipe when you feel like adding a slightly different twist to your bulgogi. Happy cooking! Do you think you can marinate it whole and cook it whole if you marinate longer, maybe overnight? 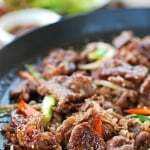 I made this Bulgogi recipe, marinated 6 hours then cooked in a broiler (in a foil lined sheet pan) for 3 minutes each side. I served it over a white rice bowl with shredded carrot and cucumber and sliced scallions. I took the used marinade and boiled/reduced it for 10 minutes to kill bacteria then cooled it and added 1/4 cup mayo and 4-5 splashes sirachi to make a sauce I smeared over the top of my rice bowl. This is an amazing recipe even my15 year ikd snot liked. This sounds great! I prefer broiling than frying (mainly because frying makes a mess!). Love your serving suggestion as well. I’m so inspired. Thanks! Yes frying does make a little mess. Thanks for coming by! You don’t put ginger in bulgogi. That’s teriyaki not bulgogi. 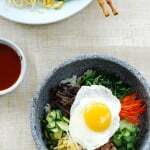 You’re not a traditional Korean cook. 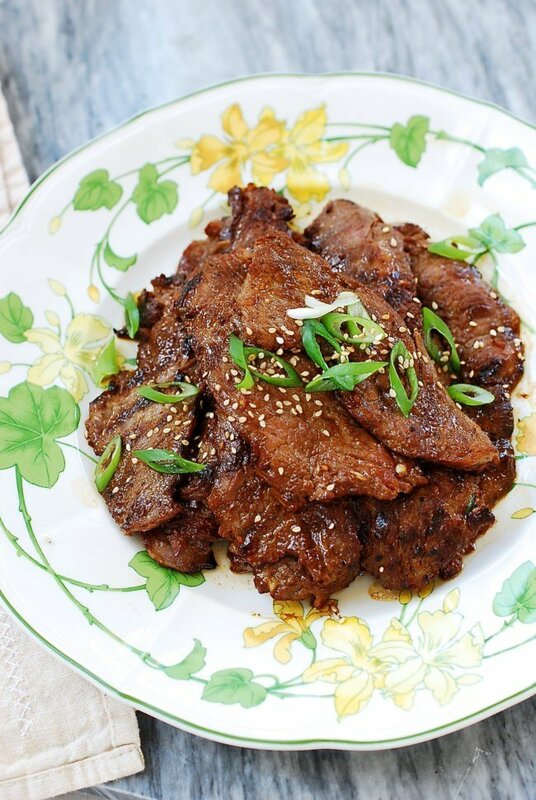 My mother always put ginger in her bulgogi marinade. 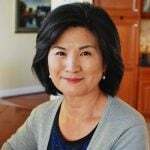 She is 75 and from North Korea originally. She is more Korean than you will ever be. Nice to know! Certainly a matter of personal preference. I honestly love this blog! there’s so many different recipes to try, even for someone who doesn’t entirely like to try new things. 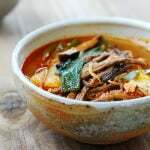 Going to be trying this tonight but I’ve already made the 닭불고기 and loved it. I’m reading the book Pachinko, by Min Jin Lee, and have been wanting to create some of the foods described in the book for my family. So excited to try this- thank you! Thank you, Carol! You just put a big smile on my face. Happy New Year! Thank you for sharing such a delicious recipe!! Hello my name is Denise. I come from a british background which typically has a bit of a bland menu. I on the other hand love to experiment with all types of cooking. My friend Brian used to bring potluck in and it was bulgogi. OMG it was the best beef I have ever tasted. So today I will be trying your recipe! Wish me luck! Hi Denise! Sorry about the late reply, but hope you it turned out well for you. If I marinate the meat overnight will it fall apart and have a strange texture due to the enzymes from the pineapple juice? 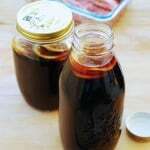 Is it best to just marinate a few hours before eating? I had kept the leftovers overnight before, and it was fine. But, use a little less pineapple juice if you’re concerned.